The Lexmark Optra X654de houses a large touch screen intended to boost productivity and the bottom-line of businesses. The multifunction printer comes with a nine-inch customizable touch-screen. The screen acts like a command center; shortcuts and icons can be tailored to user's needs. The Optra X654de is network-ready and offers MarkVision, a professional software designed to save businesses time and money with remote management. The Lexmark Optra X654de features faxing, copying, printing, scanning. The 4-in-1 device can create a recommended duty cycle of 275,000 pages a month. The 4-in-1 is 21.6 inches in width, 24.1 inches in depth, 29.7 inches in height and weighs 100 pounds. The standard memory of 256 Mega Bytes is pretty low, but the printer can support 1280 Mega Bytes. The copy-rate of 55 pages per minute is extremely high-speed. Automatic Duplexing is supported in copying. The copy features present enlargement up to 400% and a max reduction of 25%. The resolution of print is exceptional quality with 1200 x 1200 dots per inch and a print-rate of 55 pages per minute. The text quality is outstanding. The first print takes no longer than 10 seconds. After the first print, it will take less than a second for a print. The scan resolution is slightly above standard at 600 x 600 dots per inch. The fax machine is universally capable in PC faxing and phone faxing with transmission speeds of 33.6 Kilo Bytes Per Second. One of the most salient features of a printer is its capacity to be networked with other nodes. 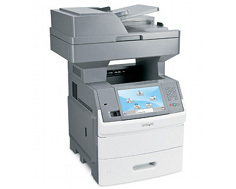 The Lexmark Optra X654de printer's connection can be established with USB host, Ethernet 10 or 100 Base-TX, and a Hi-Speed USB port. The document feeder capacity is 75 sheets with a max paper-size of 8.5 x 14 inches. You can take your pick between the standard media capacity of 650 sheets with a max media capacity of 3200 sheets. The bypass feeder capacity is 100 sheets, and the output tray capacity is a respectable 500 sheets max. The Lexmark Optra X654de printer is compatible with outdated operating systems as well as new operating systems. The newer versions of operating systems may not be included in the specs, but the Universal Driver support should assist in making the printer compatible. The MyMFP allows employees swift production when they save their personal scan/copy settings for re-access and an address book on a flash drive. With a flash drive, it is so undemanding, all you have to do is walk up to the printer, and access personal configurations with a plug-and-play. A great thing about Lexmark is their applications for enhancing the work flow. A representative will assist the owner with Solution Apps so that managers can turn data into something meaningful. 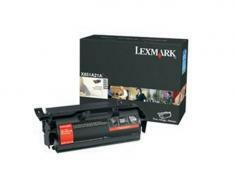 The large Lexmark Optra X654de is equipped to handle sensitive data with a fine-tuned security system. The connection ports of the printer expands its capability of networking safely via optical modem and broadband. 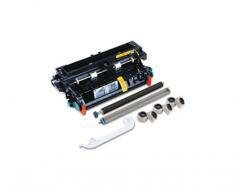 The costs of waste with ink cartridges are reduced with a high-capacity yield 36,000 pages. It weighs 100 pounds and may be considered too heavy for most. The graphics quality is poor with dark and rough prints. While Lexmark asserts the printer can print 50 something pages per minute, other users have made note that it takes at least a minute to print 30 something plain-text documents. The power requirements for running the printer is 120 volts; a 30 amp fuse can handle 120 volts, which equals to 3600 watts. The power consumption is too much for a printer when other printers can do more for less wattage. The printer costs somewhere around the area of $2,000-3,000. You will need to buy a hard disk to preview scans, and eliminating errors. 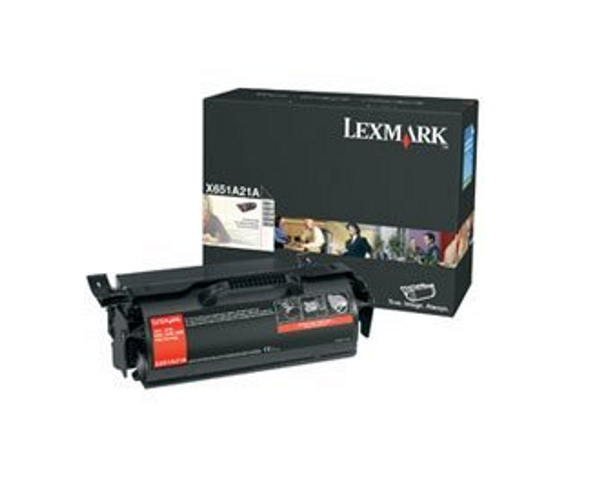 Review it: "Lexmark Optra X654de "
A black cartridge is included with the package, and the cartridge yields up to 18,000 pages. While there are various Lexmark toner cartridges compatible with different printers, the normal yield should produce up to 36,000 pages.